This top depicts an obake お化け springing out of its skin. In Japanese folklore, obake (or sometimes bakemono 化け物) are types of preternatural creatures similar to monsters or spirits that can take many forms. Their main characteristic is an ability to transform. They sometimes disguise themselves as humans (though their true form may be an animal such as a fox or cat) or can be normal household objects that transform themselves into demonic creatures (see tsukumogami). They are distinct from the spirits of the dead, although sometimes ghost-like apparitions can be called obake or bakemono. Below, you’ll find a video of Hiroi-sensei explaining the top, along with transcripts of his explanation. Hiroi Michiaki:　What is this? Ah. An obake. Hiroi: This is an obake… leaping out and spinning. MH:　That thread, you wind it around and pull it and the obake pops out. 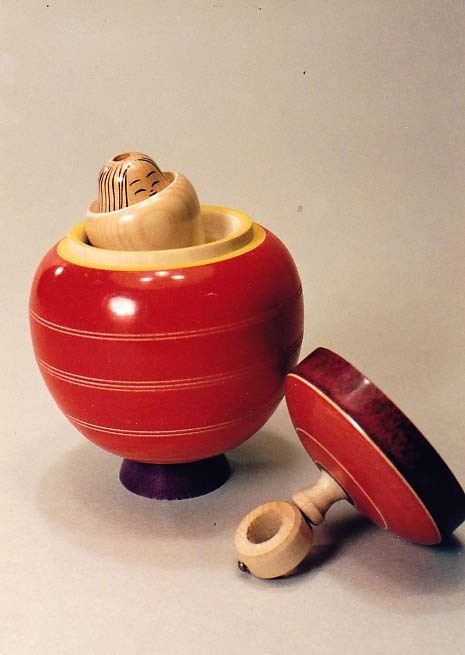 HM: When that happens, this spins and [the obake] leaps out. And this and that part inside also split into two. HM: This is the obake and this is the obake’s husk. So… oh, but does it become three? One, two, three. It becomes three. And the lid, that makes it four. It turns round and round.